No, it is not a racing game. In Real Life, driving is a monotonous chore for most people; the destination is more important than the trip. No one else drives the right way (that is, the way you want them to). Gas is too expensive and so is the price the repair shop demanded when you showed them your broken tire rod. A mere two feet of water can carry your vehicle away and a thin sheet of ice is treacherous, to say nothing of mud. Video games, on the other hand, have Acceptable Breaks from Reality, so driving is a much different experience. The two most common forms of driving games are Racing Games and Vehicular Combat games, but not all racing games and vehicular combat games will be driving games. Check out those pages for more on them specifically. For other driving games that don't neatly fit there look below. Grand Theft Auto, While much of the gameplay focus is on Third-Person Shooter aspects, you're still likely going to spend most of your time driving various cars. RAGE, hybridized with First-Person Shooter. Taken to the (il)logical extreme with the Desert Bus minigame in Penn and Teller's Smoke and Mirrors. 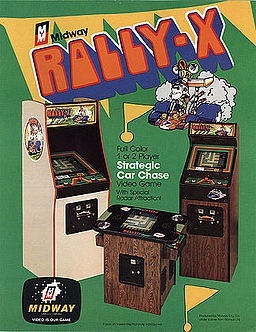 To score one point, the player has to complete, in real time, a simulation of the eight-hour drive from Tucson to Las Vegas, at a maximum speed of 45 mph, with no scenery, no passengers, and no pause button. Even worse, you can't just start up and walk away, as the bus has a slight lean to the right, and will therefore careen off the road if not monitored. This program was even used as a fund-raising mechanism as Desert Bus for Hope. The drivers ended up on the road for five days. Then they did it again. And again. Some games such as the Midtown Madness series, the Midnight Club series, and Burnout Paradise take the racing out of closed circuits and into an actual city, where races are frequently given an "open world" layout that can be run on any number of different routes. Certain scenarios in Streets of SimCity. Sega's classic OutRun. Their earlier Hang-On is the same thing WITH MOTORBIKES!, and is Older Than the NES. And their original Monaco GP is older still. It's worth a mention that OutRun is one of the few true "Driving games", meaning that the only goal is to drive a car. Although going fast is mostly encouraged as it lengthens the game time, there is no opposition save for the clock. OutRun 2006, however, does features opposition as well as mini-games such as hitting cars or avoiding meteorites. While racing is still the main attraction, Excite Truck and Excite Bots made how you reached the finish line just as important as what place you crossed it in. They also featured many other driving challenges. David Crane's Ghostbusters (1984) has a driving game sequences where you steer the Ectomobile through the busy streets, using your ghost vacuum to pick up stray roaming ghosts. The NES version complicates things further by having you collect gas cans to keep yourself from running out of fuel, and avoiding getting hit by other cars which costs you money. Geekwad Series: Wacky Funsters contains a minigame called Road Kill, which is a parody of Hard Drivin' in which you try to get to work, shooting animals along the way.